The Legacy Museum: From Enslavement to Mass Incarceration is situated on a site in Montgomery, Alabama where enslaved people were once warehoused. A block from one of the most prominent slave auction spaces in America, the Legacy Museum is steps away from an Alabama dock and rail station where tens of thousands of black people were trafficked during the 19th century. Right, a wall inside the new Legacy Museum, a project from the Equal Justice Initiative, shows how the effects of slavery are still felt in the present. "EJI* believes that the history of racial inequality and economic injustice in the United States has created continuing challenges for all Americans, and more must be done to advance our collective goal of equal justice for all. The United States has done very little to acknowledge the legacy of slavery, lynching, and racial segregation. As a result, people of color are disproportionately marginalized, disadvantaged and mistreated. The American criminal justice system is compromised by racial disparities and unreliability that is influenced by a presumption of guilt and dangerousness that is often assigned to people of color. For more than a decade, EJI has been conducting extensive research into the history of racial injustice and the narratives that have sustained injustice across generations. The new museum is the physical manifestation of that research." The 11,000-square-foot museum in Montgomery, Alabama, was built on the site of a former warehouse where enslaved black people were imprisoned and is located midway between a historic slave market and the main river dock and train station where tens of thousands of enslaved people were trafficked during the height of the domestic slave trade. Montgomery's proximity to the fertile Black Belt region, where slaveowners amassed large enslaved populations to work the rich soil, elevated Montgomery's prominence in domestic trafficking, and by 1860, Montgomery was the capital of the domestic slave trade in Alabama, one of the two largest slave-owning states in America. 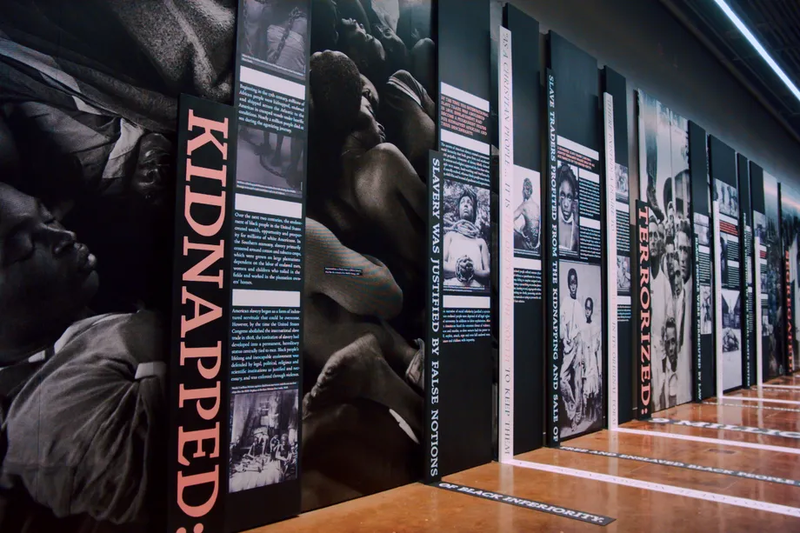 The Legacy Museum employs unique technology to dramatize the enslavement of African Americans, the evolution of racial terror lynchings, legalized racial segregation and racial hierarchy in America. Relying on rarely seen first-person accounts of the domestic slave trade, EJI’s critically acclaimed research materials, videography, exhibits on lynching and recently composed content on segregation, this museum will explore the history of racial inequality and its relationship to a range of contemporary issues from mass incarceration to police violence. Visitors will encounter a powerful sense of place when they enter the museum and confront slave pen replicas, where you can see, hear, and get close to what it was like to be imprisoned awaiting sale at the nearby auction block. First-person accounts from enslaved people narrate the sights and sounds of the domestic slave trade. Extensive research and videography help visitors understand the racial terrorism of lynching and the humiliation of the Jim Crow South. Compelling visuals and data-rich exhibits give visitors the opportunity to investigate America's history of racial injustice and its legacy, drawing dynamic connections across generations of Americans impacted by the narrative of racial difference. EJI has curated sculptures from Titus Kaphar and Sanford Biggers, a wide range of videography and animated content from leading filmmakers and artists, and fine art pieces including works from Elizabeth Catlett, John Biggers, Yvonne Meo and Kay Brown, an art which will challenge and inspire visitors. Design and creative partners also include Local Projects, Tim Lewis and TALA, Molly Crabapple, Orchid Création, Stink Studios, Human Pictures, HBO, and Google. An unparalleled resource for researchers, the museum houses the nation's most comprehensive collection of data on lynching. It will also present previously unseen archival information about the domestic slave trade brought to life through new technology. As a physical site and an outreach program, the Legacy Museum: From Enslavement to Mass Incarceration is an engine for education about the legacy of racial inequality and for the truth and reconciliation that leads to real solutions to contemporary problems. *The Equal Justice Initiative (EJI) is committed to ending mass incarceration and excessive punishment in the United States, to challenging racial and economic injustice, and to protecting basic human rights for the most vulnerable people in American society.